It's the logical solution to help organize your practice and give your patients the most efficient and effective care. 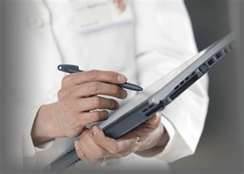 The VeinSpec electronic medical record system is an intuitive application designed especially for Vein, Vascular or General Surgery practices to streamline daily workflow by eliminating cumbersome paper charts and efficiently storing and maintaining your medical charts, images, diagnosis, and prescription data. And convert them into a compact digital format freeing up office space and your professional life.